I got into playing and making music in the mid 90s, and have written and recorded songs under the name Soundream. My mate Craig has helped with the writing and recording of many of the Soundream songs. I've also been in several bands with my mate Chris, and in the early 2010s I helped him record some of his stuff. I haven't had any real motivation for music since early 2016, and have no plans to get back into it. Written and performed by Stebloke. Completed October 2014. Updated May 2016. Never wanted sibling rivalry. Never foresaw such a tragedy. They never paused to explain why, they just ripped her from the sky. Branded fallen for her life, and now it's her purpose to kill again and again at the rift. Shattered wings and immortality. Keeps her hands warm though it's sinfully. Tormented soil, she's breaking waves. She will bind their souls someday. Kinda likes how she behaves, 'Cause now it's her purpose to kill again and again at the rift. Her graceful time was stolen from. All she wanted was some fun. Now exposed, the scars of war. Her world enslaved, it seems so far. Fractured by tyrannic lies. If they'd just seen things through her eyes. Missed the chance for sense to see. She'll never welcome back her kin. When they stripped her chance to soar, they made her seek forbidden lore. Blackest thorns, death on command, in this land of Valoran. Never mind her skin so fair, as all her torment she will share. 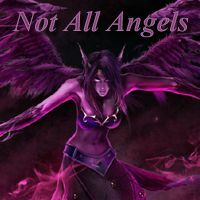 When it's time she'll spill their blood, because not all angels are good. Completed July 2011. Updated May 2016. Don't pull me out from where I hide. I'm lost in thought where I confide. I'll dream away, this place I'll stay, until this world decides to pay. My head's full of what should be. A dreamscape home made just for me. Sun shines warm but rays don't burn. And you keep all of what you earn. Living, living, living in a fantasy world, where everyone is happy now. Living, living, living in a fantasy world. People lie chilled on their backs. No politicians feed their crap. Crime is down, dance music's dead. If only this was not my head. I stay at home and dream of you. A dream I know that can't come true. The people out give me a miss, 'cause where I go does not exist. CHOSEN OF THE MOON: Let night steal away the sun. By the moon let fools be frozen. Now your end it has begun. Say goodbye to your kind's chosen. Traitors. Miscreants. Fakers. Ignorants. Heed the night. Embrace the dark. Or a crescent blade will still your heart. Power imbued beneath the silver light bathing the ground. Blind to the truth - denying lunar might will bring you down. You say revere the sun but we are lied to. You say it lights the way instead it blinds you. You can't face the scorn, can't save them all, can't stave your fall. It's time to shatter the dawn. CHOSEN OF THE SUN: Rise. Here comes the sun. Skin warmed by the golden rays that show with daybreak. Stand strong behind shield and blade, and glow, radiate. When first light comes show no fear when the heat of battle calls because here comes the sun, to save everyone. Here comes the sun. The night's on the run. Live life upon mountain high and show devotion. Inspire all to stand up and bestow protection. 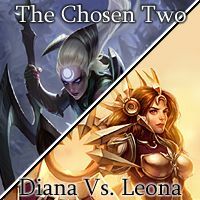 It's poetic - the chosen will clash and the heretic will know. Written by Stebloke and Craig Williamson. ALIENS: Look at this world, this beautiful world. A miracle. A paradise. But under the sun their damage is done. If only they'd just open their eyes. So they can see their majesty, potentially. All over this world, cries can be heard, littering all of history. Is it too late to rid them of hate, as making a change could set them free? It's theirs to lose, so can we choose? Are they all fools? Will the last hope for this planet come from their own? Will their actions be organic? Will they atone? Will time and space bring their amends? Or will they face their bitter end? Is this the one? 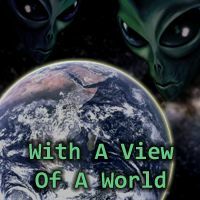 What can be done with a view of a world? HUMAN: The stars say so much. What's so wrong? Longing to feel I belong. I fear all hope's in vain. So tired of all this pain, because I can't find peace of mind. I need to leave this world behind. 'Cause I'm crying, trying, needing, bleeding, as I'm watching, waiting for a sign of redemption. I live my life, waiting for an intervention. 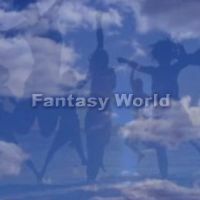 What can be done with a view of a world? Initiate. Make a dive for the middle. Pick a mark, get involved, give 'em trouble. Move out to the flank, prep 'em for a gank all the lanes. Bring the hurt floor the carry. Make them wish that they weren't adversaries. Time to hard engage. Time to make 'em rage. Gonna bring the pain. Gonna change the game. Team needs aggression. Objectives first. Foes need a lesson. Prepare the burst. So bring perfection. Set up the show with crowd control. 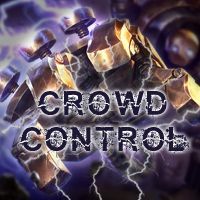 Achieve the goal with crowd control. Rock and roll with crowd control. Retaliate. Make 'em pay for their trouble. They think they're gonna bring the pain? Give 'em double. Gonna stamp around. Gonna shut 'em down on the rift. Play it calm, turn to savage. Gotta counter swift prevent all their damage. Block 'em with a wall. And then stun them all. Gonna lock 'em up. Gonna land a hook. Team needs protecting. With crescendo. Skill interrupting. Weakness exposed. Offense deflecting. Now bring them low with crowd control. Now dominate. Serve them up on an arrow. Tidal wave leaves them all feeling sorrow. And with a nether grasp, put em on their assassinate, apprehend, slow with zephyr. Land a bind, terrify, taunt their effort. See hatred in their eyes. When you pulverize. Gonna score an ace. Gonna wreck their face. Team fight injection. It's time to shine. To bring conclusion. Support divine. Such an obsession. The world will know your crowd control. A parody of Everlong by the Foo Fighters, written by Dave Grohl. Evelynn lyrics written by Stebloke. Shadows, she's sneaking up on through. 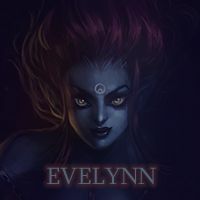 Evelynn. Delight, she throws herself into. Her prey's up ahead. Rage will be fed. They're damned. Come now. Embrace the agony. Time to feed. Run now, but it won't help to flee. Hate spike through the leg. Soon they'll be dead. They're damned. It's all over. She loves when they scream on cue. There's no escape when she impales them for her pleasure. There's no escaping and her frenzy brings the end. And she won't stop until they're torn in two. They'll find no solace when she lets her fun begin. They're damned. Scream out. It wakes her beast within. Death begins. Ends now she draws their essence in. Ground painted red. Now they are dead. They're damned. Drums, guitars and backing vocals by Chris Perfit. Vocals, acoustic guitars and orchestration by Chris Perfit. Bass, electric guitars and backing vocals by Stebloke. Vocals, guitars and drums by Chris Perfit. Vocals, guitars, harmonica and orchestration by Chris Perfit. Written by Chris Perfit and Mick Hatton. Bass and backing vocals by Stebloke. Drums and guitars by Chris Perfit. A lot of the tabs you can find on the internet are completely crap and sound nothing like the song they are supposed to be. Sometimes I try and work out songs I like, and from now on I will be putting these tabs here. I am not saying I am any more correct than anyone else who puts tabs on the internet. I'm just saying they sound a lot closer to me, and this is how I play them. Because I'm not a great guitar player, I rarely work out solos, so don't expect them. Tabs are all downloadable pdf files. Right click the tab(s) of your choice, and select the relevant download option. When We Stand Together, by Nickelback. Tabbed April 2015. Get Jinxed, from League Of Legends, by Riot Games. Tabbed April 2014. I play my Get Jinxed tab (Youtube). Collecting Casualties, by Running The Risk. Tabbed March 2014. Here Comes Vi, from League Of Legends, by Riot Games. Tabbed December 2013. I play my Here Comes Vi tab (Youtube). Fly On The Wall, by Thunder. Tabbed August 2013. Burn It To The Ground, by Nickelback. Tabbed October 2011. Ring Of Fire, by Def Leppard. Tabbed January 2010. Too Much To Dream, from California Dreams. Tabbed October 2008. Low Life In High Places, by Thunder. Tabbed September 2007. Note this is the intro only. Four Letter Word, by Def Leppard. Tabbed August 2007.